Breaking your kitchen cleaning chores down into daily, weekly, monthly, and annual or semi-annual tasks can help you keep your kitchen clean and organized. Using a checklist, like the one included below, allows you to track your cleaning so you don't miss anything. Use this printable kitchen cleaning chore list to help you keep track of your kitchen cleaning tasks. To download, click on the image and follow the prompts on your screen. If you need additional help, use this guide for Adobe printables. 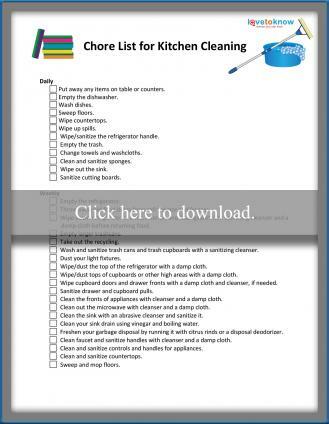 Download a printable kitchen chore list. Break your tasks into daily, weekly, monthly, and once or twice a year. It may help to note on your calender when you plan to perform monthly and annual tasks so you don't forget. Daily tasks include simple daily cleaning to keep dishes cleaned and put away, counter spaces clean and free of debris, and floors swept. Practicing daily tasks will help keep your kitchen sanitary, and will help you avoid contamination that may lead to food borne illnesses. Perform daily tasks after meals. For counter cleaning, use a spray cleaner or a mild cleanser in hot water. To avoid cross contamination, wipe counters with paper towels or kitchen towels you wash daily. If you use a kitchen sponge, sanitize it in a bleach water solution daily to avoid cross-contamination. Sanitize cutting boards with boiling water, in the dishwasher, or with a bleach water solution. Replace bin liners if you empty trash to keep trash cans sanitized. Use an abrasive cleanser to clean any stains out of the sink. Weekly tasks can be undertaken as part of your weekly house cleaning. These tasks will help you perform a deeper cleaning on your kitchen and allow you to keep your cupboards, pantry, and refrigerator organized. It will also remove any dirt that has clung to surfaces while sanitizing the surfaces. For this deeper cleaning, use a sanitizing cleanser to wipe away any bacteria that is lingering on cooking surfaces. Weekly cleaning also helps you deodorize your kitchen to remove any lingering aromas from the week. Work from high surfaces to low surfaces so any dust or debris falls downward as you clean and gets cleaned up as you work on lower surfaces. Use a sanitizing cleanser or bleach water solution to clean refrigerator shelves, doors, and drawers. Use a sanitizing cleanser or bleach water solution to clean and deodorize trashcans and recycling bins. 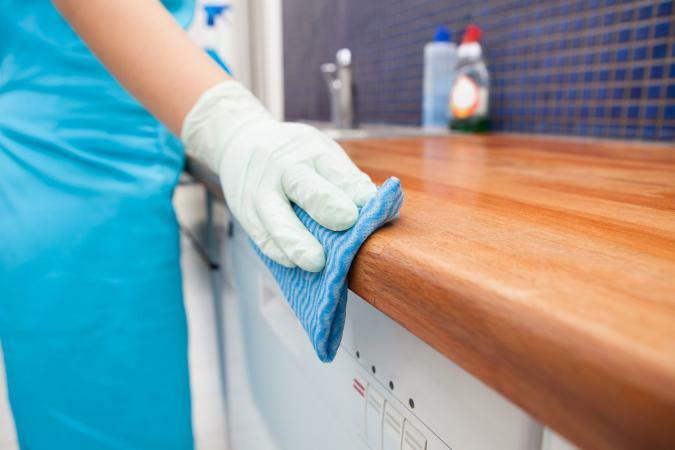 Use a clean cloth (not one you've already used to wipe away stains or sanitize the refrigerator) and sanitizing cleanser or bleach water solution to wipe counters, cupboard doors, drawer pulls, appliance knobs, and door pulls. Sweep and mop floors last. You may wish to use a vacuum to clean under where cabinets overhang the floor. Monthly tasks include deeper cleaning and allow you to keep clutter at bay, keep your windows clean, and keep your appliances clean and sanitized. Degreasing your stovetop and grates monthly will also help improve kitchen safety by minimizing the risk of fire. Use a degreasing cleanser for stove and grates, or use a cleanser designed for your stove type. Use window cleaner and wadded up newspapers for a streak-free shine on your windows. Many people perform the once or twice a year tasks when they do their annual "spring cleaning." This is the deepest level of cleaning for your kitchen and allows you to remove clutter that has accumulated while cleaning deeply to remove any dirt, grime, or debris. It also allows you to clean in areas you don't the rest of the year, such as behind your refrigerator and on your walls. This is the cleaning that leaves your kitchen sparkling clean and ready for another year's use. Keeping your kitchen clean, sanitized, and organized can help you avoid food borne illnesses. It also makes your kitchen a more pleasant and easy place for your family to work.